There's a strangely cheery energy to the album as well. This is something that would be a hallmark of the intertwined dance that New Order and The Cure would perform over the next couple of years. This was to the extent that it sometimes seemed the distinguishing factor of a song wouldn't emerge fully until it was clear if the singer was Bernard Sumner or Robert Smith. However The Cure always possessed the sense of a singular voice going through eternal moods of structure and collapse in equal measure, wooziness and queasy pirouetting. Whereas by this point the rigorous structure of what was New Order remained crucial, especially that sense of being something not too far removed from Can, Kraftwerk and other Teutonic proponents of total focus. And now this sound was more openly underscored by the electronic disco rigour that continued to flourish worldwide. Sumner (or his narrative voice) opened the album confessing that he doesn't necessarily want to have to say what his desires are. This is an apt statement from the singer for a band who hadn't even wanted the job. But then he has to spend an entire album - for the first time ever - teasing a lot of things out song for song, however guardedly, however flippantly, however metaphorically. So why not write a song revolving around an image of lonely souls on deserted islands, except avoiding the kind of approach that the Police had dealt with a few years previously on 'Message In A Bottle' say. So Sumner, who heard so much desire for connection from Ian Curtis, came up with a much better lyric than Sting ever could. And he did it in a less mannered fashion, in a way that actually didn't want to resolve into easy romantic sentiment, on 'Leave Me Alone'. Power, Corruption and Lies is an album I have listened to a lot, mostly in the 1990s; first to a dodgy Indonesian cassette copy, adorned with a cut-out photograph of the album cover and padded out with tracks from other albums, which I picked up at a flea market, and then to the official Australian CD release, padded out with Blue Monday/The Beach. I lived in the outer suburbs of Melbourne then and thus spent a lot of time driving, and a cassette of Power, Corruption and Lies would often spend time in the car stereo. I haven't listened to it as much over the past decade or so (taking it out occasionally, but that's it), but I still know the lie of the album like the back of my hand. (Though, the Power, Corruption and Lies I was familiar with segued from 5-8-6 into the 12" mix of Blue Monday, before easing back into the more languid, resigned Your Silent Face, a flow which, despite its historical and authorial inauthenticity, made perfect sense to me.) Anyway, Power, Corruption and Lies remains my favourite New Order album (though in my opinion, they drop off a bit after Low-Life, a close follower), and Leave Me Alone is probably my favourite of their songs. 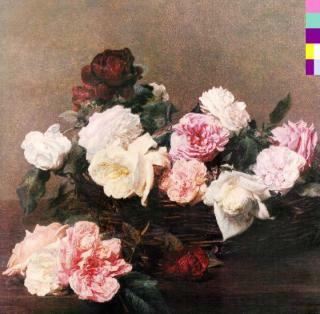 There are no comments yet on "Power, Corruption and Lies at 30"